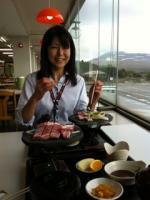 I'll introduce nice lunch ,sweets and food from Fukuoka, Kyushu and Japan especially for foreign visitors. The fruits used may vary according to season. 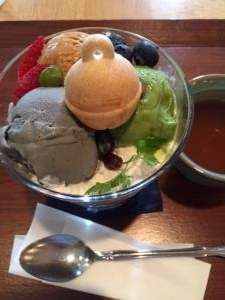 Customers can choose three out of four ice-cream flavors: maccha(green-tea), goma(sesame),caramel, or vanilla. 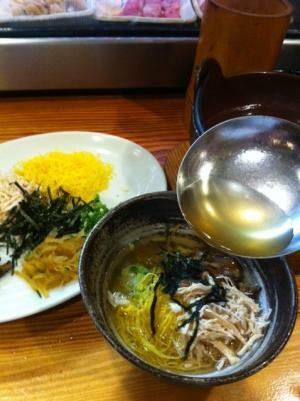 Hoji-cha (roasted tea…nice aroma!) 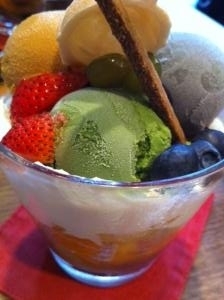 is served with the parfait. 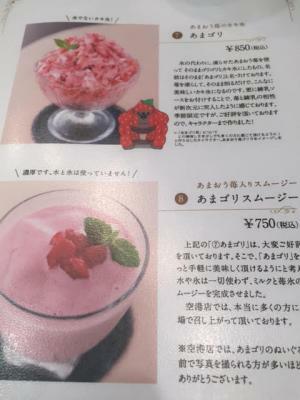 Suzukake shop’s menu In addition to the parfait, the shop offers other Japanese sweets and lunch, which is also popular. 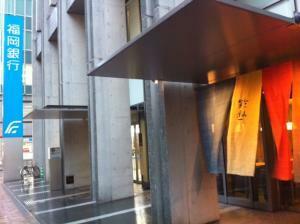 The entrance and the shop’s curtain of Suzukake flagship store. 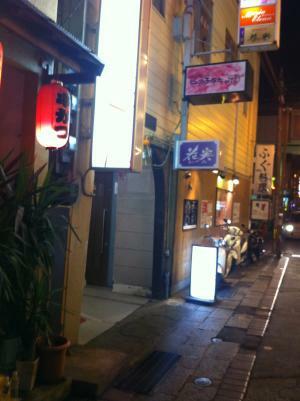 It’s easy to find Suzukake: it is next to Fukuoka Bank’s Nakasu branch. sold in lovely bamboo baskets. 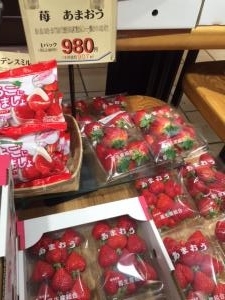 Amaou strawberries sold at a department store. The name “Amaou” is an acronym: each letter stands for a different word. A=amai (sweet), ma=maarui(round), o=ookii(big), u=umai(tasty). 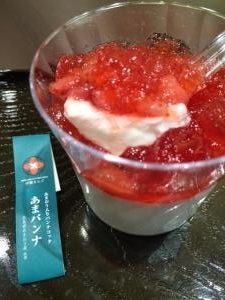 The Amaou strawberry is one of the most popular in Japan. Not only the fresh strawberries but the various confectionary kinds made from them have a distinctive aroma and sweetness. 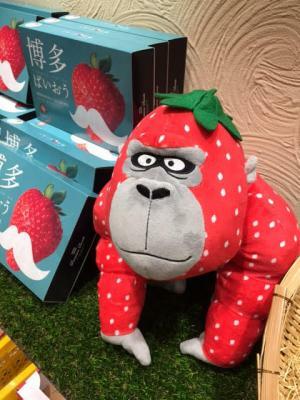 The Ito-King confectionary shop uses Amaou strawberries grown in the Itoshima area of Fukuoka prefecture. 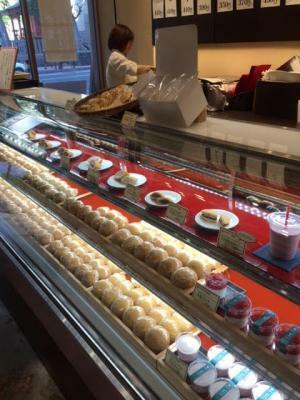 There are four Ito-King shops in Fukuoka Prefecture, the HQ in Itoshima Peninsula, JR Hakata Station (B1F), Fukuoka Airport (2nd floor in Domestic Terminal 2), and this Tenjin shop (1F) and café (2F). 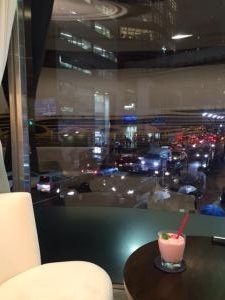 The Tenjin shop’s café on the 2nd floor offers a delicious menu of Amaou strawberry sweets and relaxing atmosphere. And the writer believes strawberry sweets with the vitamin C are healthier than other sweets! The most popular confectionary in the shop “Dora-King-Nama”. 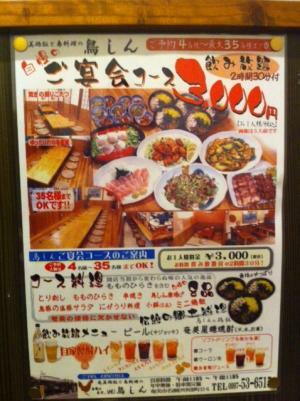 Each costs 410 yen if purchased for take away. Same confectionary ordered in the shop’s café on the 2nd floor costs 560 yen or 1000 yen with tea or coffee and small bite-size confectionaries. 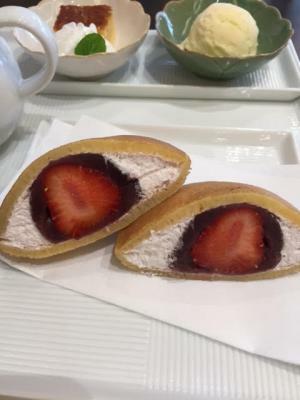 A thin, mochi, ricecake-like bun is stuffed with strawberry cream, red-bean jam, and a fresh Amaou strawberry in the middle. Pannacotta topped with Amaou-strawberry jelly. 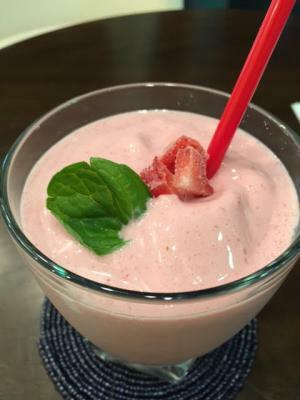 A fresh creamy Amaou-strawberry smoothie. 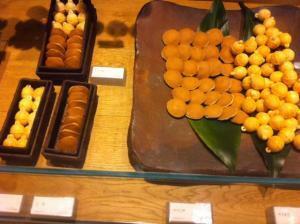 The shop offers many strawberry “dorayaki”,buns stuffed with sweet ingredients include “Matcha, green-tea” flavored cream. 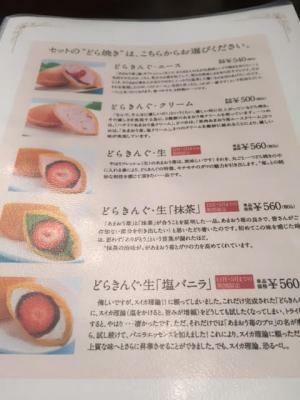 The strawberry “dorayaki” bun menu. favorites. 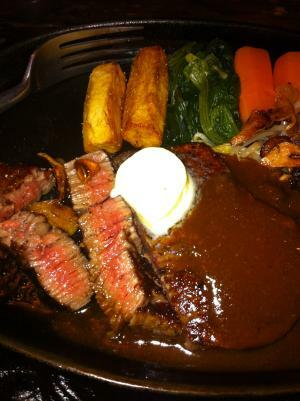 The marbled beef is very tender, juicy and tasty. provinces - and each prefecture has its own brand of Wagyu. 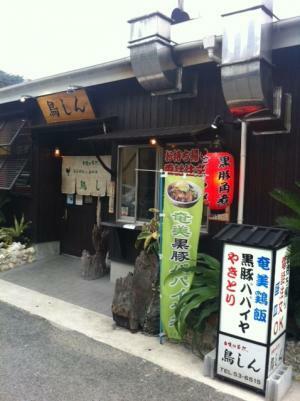 hot-spring are 2 must-do things when you travel in Kyushu! The chef is ready to grill vegetables and beef. The entrance to Somuri on the 2nd floor of the building. Prefectural Bungo Beef Distribution and Promotion Council. The neighborhood of the building. rice, or other prize. It is very unique autumn event! only to Satsuma samurai officers (Kagoshima warrior officers who governed the area). A bowl of rice is served with shredded or chopped garnishes, usually cooked chicken, mushroom, leek, omelet, pickled papaya and so on. Then a rich clear chicken broth is powered over the rice and garnishes. 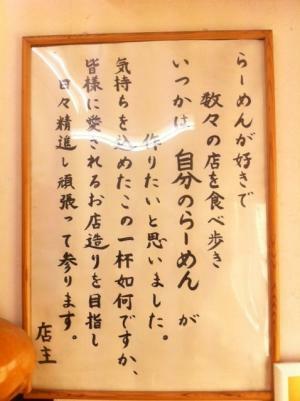 The pub restaurant Torishin, very famous in Amami City on the biggest island Amamioshima, serves a 7 -course chicken dinner with all-you-can-drink for 2.5 hours for 3000 yen. 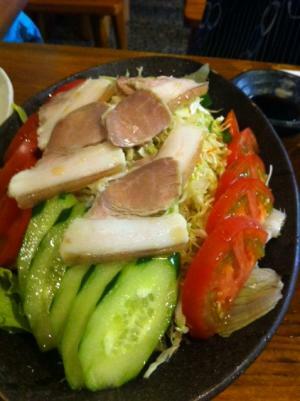 The course includes chicken-sashimi, grilled chicken, deep fried chicken and final course is Keihan. The rich, aromatic Honkaku Amami Kokuto-shochu or genuine Amami brown-sugar liquor brewed only in Amami is worth having with the tasty chicken; for nondrinkers, tropical juice such as passion fruit is also nice. 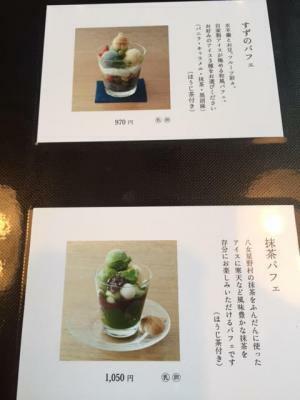 For customers who want Keihan only, they can order a full sized “Keihan” at 1000 yen. 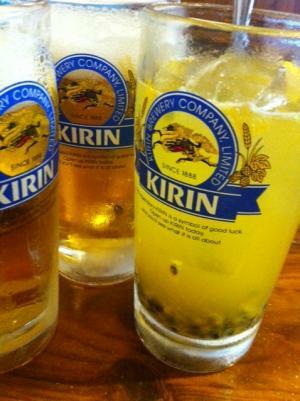 Torishin also offers home delivery Keihan. 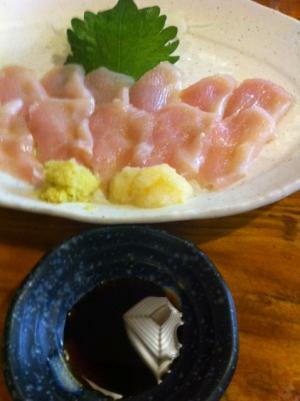 Fresh “torisashi” or raw sliced chicken dipped in soy sauce, grated ginger and garlic. 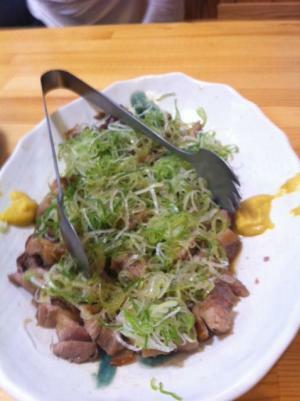 “Shiobuta” or salted pork and salad. The pork is very juicy. 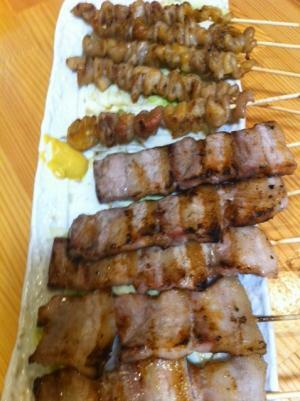 Charcoal-grilled and sliced chicken leg-meat. 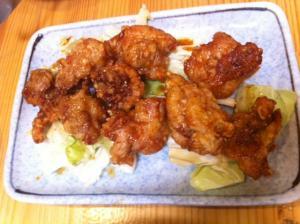 The tasty chicken is served with vinegar and soy sauce. Deep fried and seasoned chicken, tasty and juicy. “Goya” or bitter melon charges you with energy. 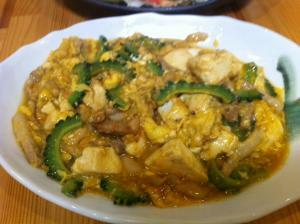 Today’s goya menu offers very soft scrambled eggs and sliced goya. 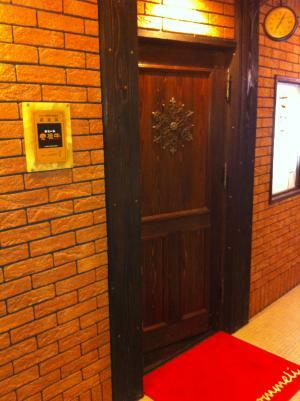 The entrance of Torishin. 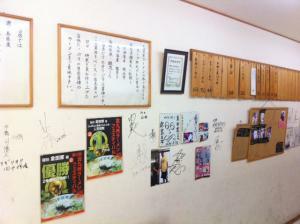 It is located in Naze in downtown Amami City. shown is for four people or more. 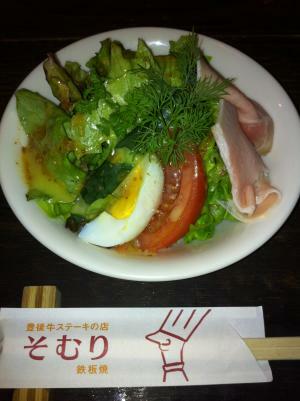 Keihan a la carte at 1000 yen: we make this bowl of Keihan at least 3 times by ourselves! very full! 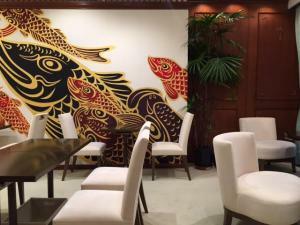 First-time customers at Kanadaya can be forgiven for thinking they've been served cappucino; they are surprised to see white “foam” on the surface of this shop's tonkotsu ramen soup, but happy when they taste the rich savory tonkotsu soup. 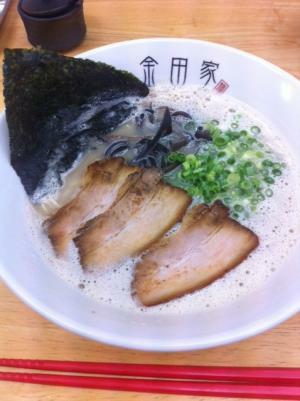 Tonkotsu literally means “pork bone” and Kanadaya's tonkotsu ramen soup is a mixture of pork-bone broth and small amount of a special sauce. 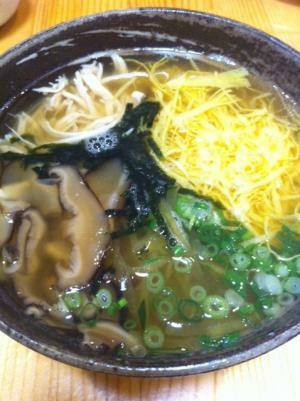 Kanadaya’s tonkotsu soup is creamy and bubbly thanks to the taisho (master)’s efforts. 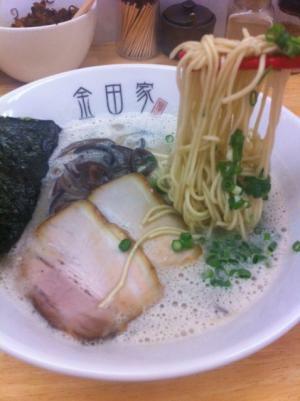 Ever since opening Kanadaya in 2009, he has never stopped developing his “tonkotsu” soup. 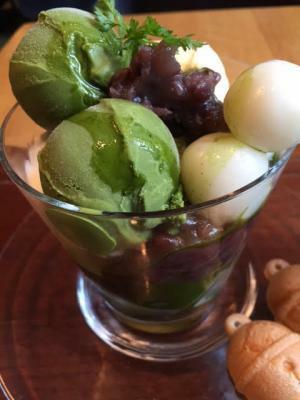 He never uses shorts ts to produce his tonkotsu soup; he uses only high quality ingredients, such as Satsuma Kurobuta (a brand pork) bone for the tonkotsu broth, quality soy sauce with quality dried kelp and shiitake mushrooms for the special sauce. Long simmering of the kurobuta tonkotsu, and skimming off excess oil produces a creamy tonkotsu soup that really attracts tonkotsu ramen fans! 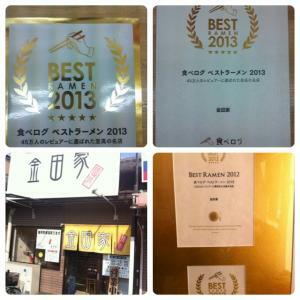 Tabelog (a restaurant ranking service like Yelp or Amazon’s) selected Kanadaya's as a best Fukuoka tonkotsu ramen in 2009, 2012 and 2013. On weekends, lots of customers line up in front of the shop! The first overseas shop (in Hong Kong and in London) will be opened in 2014 by an entrepreneur and his friends who love Kanadaya ramen! autographs including those of famous people. 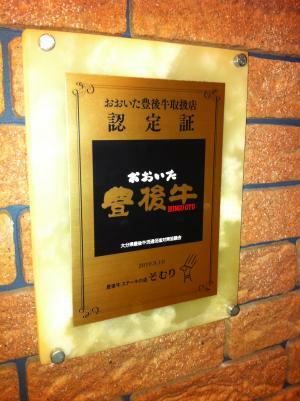 Kanadaya’s Tabelog certificate designating it A Best Tonkotsu Ramen. Kanadaya’s taisho(master) and okamisan(master’s wife) with Tony (entrepreneur from Hong Kong)and his best friends/ business partners Sam (for Hong Kong shop) and Aaron (for London shop);the three talented young businessmen studied economics at London University. 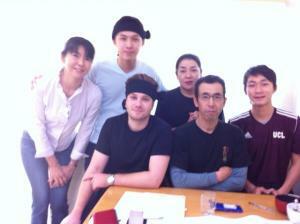 And me, hired as the interpreter since I love food and live in Fukuoka! The photo was taken to commemorate the signing of the contract and the start of their training in Nov. 2013. Good Luck!! 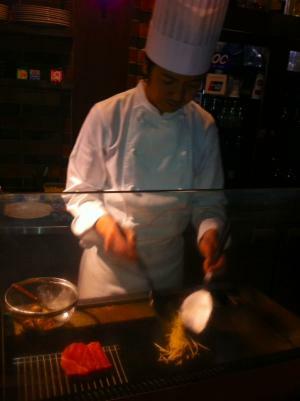 I am an English tour guide from Fukuoka! 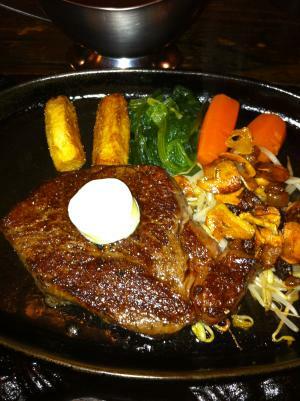 I'll introduce delicious food from Fukuoka, Kyushu and Japan! 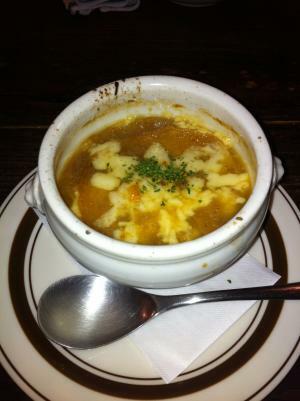 I hope the food information here will bring you more enjoyable time in Japan. For my tour-guiding service, please check JGA(Japan Guide Association) Tour Guide-Interpreter Search System.